Special thermal printing will withstand scratches and is impervious to humidity, water and heat. Polyester material will not tear like laminated" paper label. 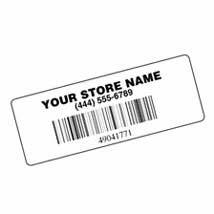 Personalized with store name, telephone number and Bar Code #`s. The start # depends on your system. Prices per thousand. Prepayment required. 1000/Roll.